Preheat the oven to 200°C/400°F. Wash the blackcurrants and add to a saucepan set over medium-high heat with water and honey. Simmer for approx. 5 min., then remove from heat and and add mustard. Transfer to a serving bowl and set aside. Line a baking sheet with parchment paper, if needed. Cut the chicken breasts into strips. Blend the pistachios, sunflower seeds, breadcrumbs, parsley, salt, and cayenne pepper in a food processor until fine and uniform. Add the mixture to a shallow plate. Whisk the eggs in a shallow bowl and dredge each piece of chicken in them. Then coat each piece in the nut mixture well. Place the chicken tenders onto the baking sheet and drizzle with olive oil. Transfer to oven at 200°C/400°F for approx. 20 min., or until the chicken tenders are golden brown and the chicken is cooked through. 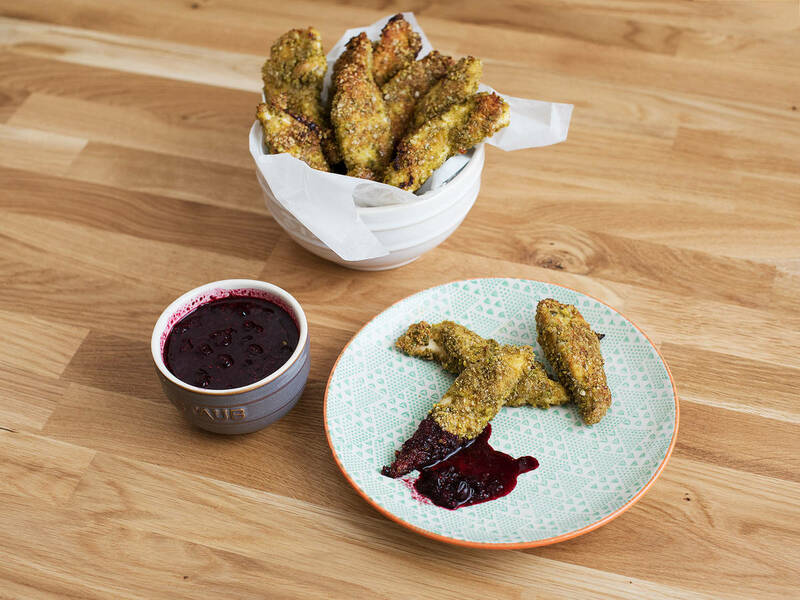 Serve with the blackcurrant dip and enjoy!